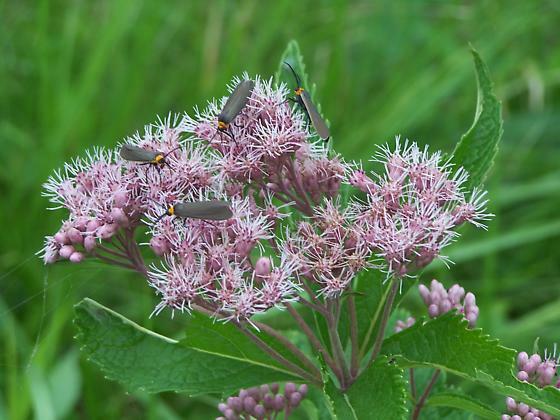 I found these while taking pictures of wild flowers.I was thinking that they are Virginia Ctenucha, I am not sure. but these lack the metallic blue cape of C. virginica. Please, correct the date, it could not be that. Must have been late Summer or Fall, not the middle of winter. I think that Matthew is right about ID. Yes your right I took these pictures some time in August.Sorry about the date. Pretty certain this is species Cisseps fulvicollis - Yellow-collared Scape Moth - Hodges# 8267, instead of Virginia Ctenucha. Matthew Roth Thank you! I can see now that this is a Cisseps.